From logs of U.S. Naval ships and Stations, 1965, USS Savage DER-386. [Christmas Outing 24 December, 1965 Friday]. 0812 commenced maneuvering on various courses at various speeds to recover air drop. 0848 completed recovery. Set course 355 T, speed 12 kts. 0918 c/c 000 T. 0935 set the anchor detail. 0943 commenced maneuvering on various courses at various speeds. To hilo marine anchorage. 1001 all engines stop. 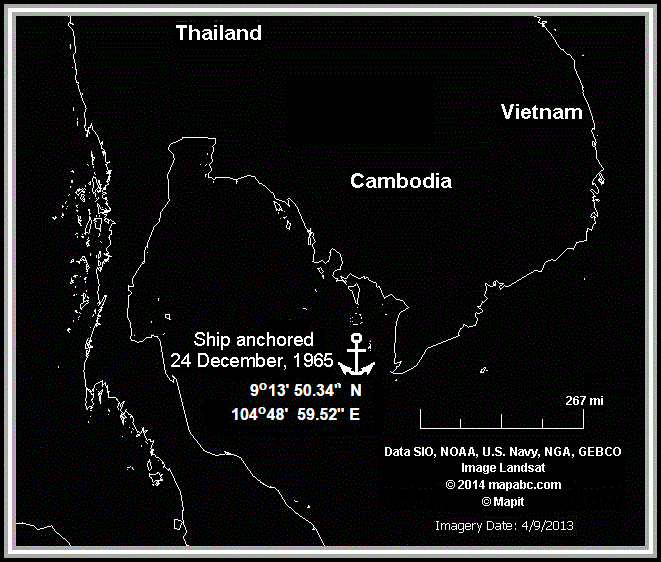 Anchored off the Isle de Poulo Dama, South Vietnam in 8 fathoms of water. Mud bottom with 35 fathoms to the starboard anchor on the following bearings: Hon Mau 187 T Hon Dau 252 T Hon Trong 321 T.
B. J. Heeb, LTJG, USN. Plan of the Day 1967 Softball in Kowloon Tora! Tora! Tora!